Your pet will live a longer, healthier life. Spaying helps prevent uterine infections, sexually transmitted tumors, and breast cancer. Your male dog won’t roam away from home. An intact male will do just about anything to find a mate! That includes escaping from the house, and once he’s free to roam, he risks injury in traffic and fights with other males. Neutered cats and dogs focus their attention on their human families. Many aggression problems can be avoided by early neutering. Don’t use that old excuse! Lack of exercise and overfeeding will cause your pet to pack on the extra pounds—not neutering. The cost of your pet’s spay/neuter surgery is a lot less than the cost of having and caring for a litter. It also beats the cost of treatment when your unaltered pet escapes and gets into fights with the neighborhood dogs! Stray animals pose a real problem in many parts of the island. Spaying and neutering packs a powerful punch in reducing the number of unwanted animals on the streets. Homeless animals are forced to fight for survival often times starving on the street, being injured, and ultimately face untimely horrific deaths. Every year, thousands of cats and dogs suffer as strays. These high numbers are the result of unplanned litters that could have been prevented by spaying or neutering. At HelpAWS, we strongly believe that through Spay and Neuter we will reduce the number of animals who suffer on the street and face untimely horrific deaths. 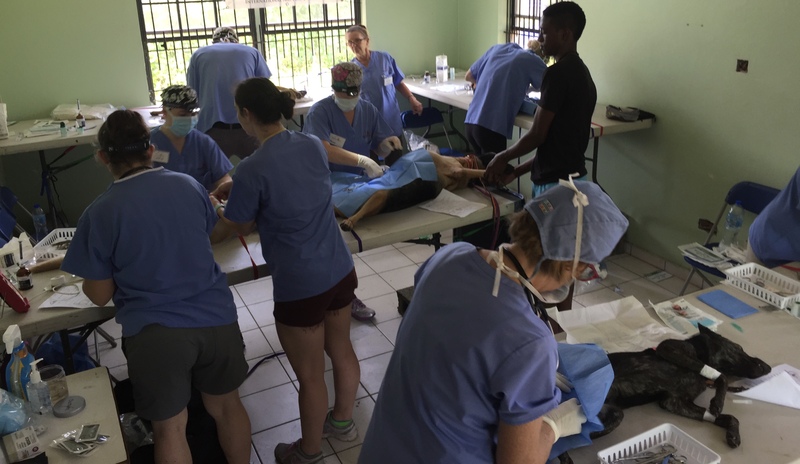 Since 2015, along with our partners TOCO, we have been working with various international groups where we organize a 4 day high volume spay and neuter clinic. These clinics are held either once or twice a year with a goal of sterilizing 400 animals in the 4 days. We target stray animals, or animals from low income families who would not be able to afford the surgery. To date, we have sterilized over 2,000 dogs and cats on the island and continue to do which is saving many lives! We also do TNR (Trap-Neuter-Return) programs where we humanely catch feral cats, have them spayed/neutered, and release them back into the wild. To date, we have sterilized nearly 100 feral cats. Sponsor a Stray to get Spayed! We started a new campaign! Every other Tuesday, we get up at the crack of dawn to go catch strays and free roaming dogs to bring them to get sterilized. Help Us, Help Them get Spayed or Neutered by donating today!